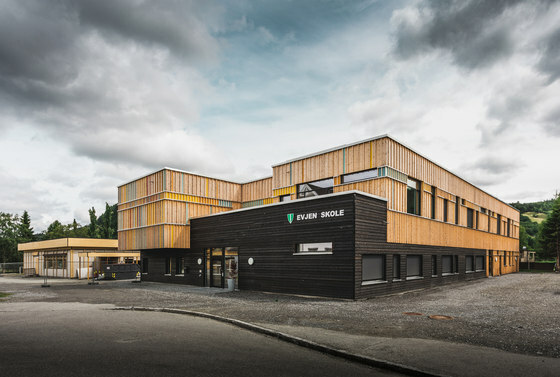 The New Evjen school project is an outcome of an architectural competition, which was won by Pir II in 2016. 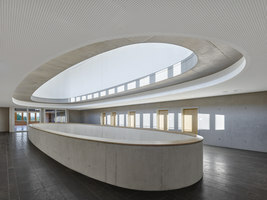 In the report the jury highlighted the ‘simple and convincing concept with internal atrium and mini-amphitheatre and its pleasant and playful architecture.’ The main focus for the project has been combining playful architecture and reducing the environmental footprint of the building through careful material choice and minimising energy demand. 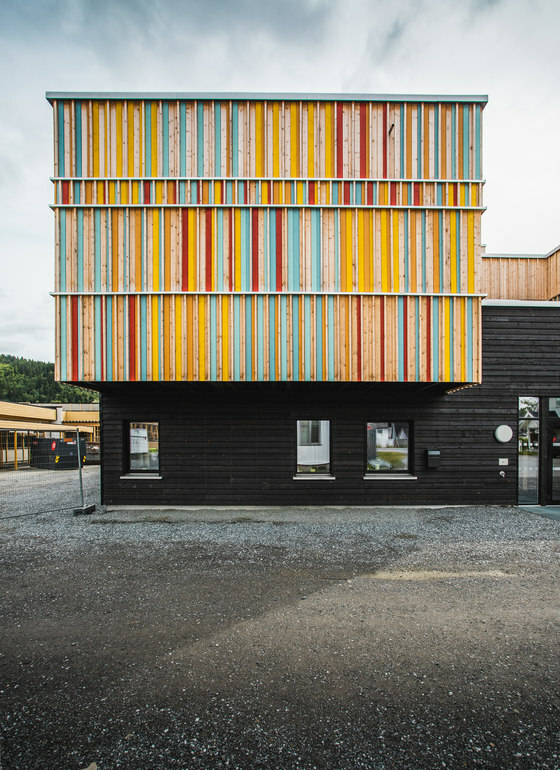 The new school building is located in Orkanger, a town in Norway with 8 100 inhabitants. After the frst building phase (completed spring 2018), the new 1 800 sqm building will house 125 pupils, grades 4-7. 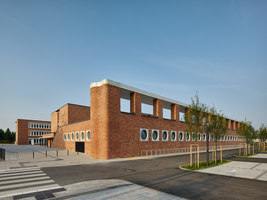 The new building completes an existing school compound with several buildings dating from diﬀerent periods and built in various styles. 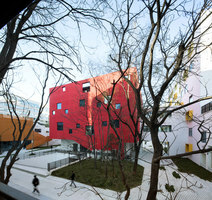 The new school building brings a modern addition to the compound, but also makes references to the existing buildings through the use of materials, colour and proportions of volumes. 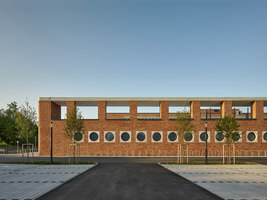 Part of an old school building will be demolished to create a common school yard (to be completed in 2019), which is surrounded by all school buildings, including the new building to the south. 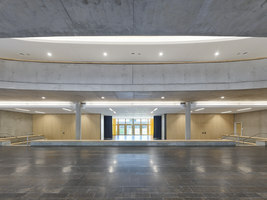 The new school building is characterised by a simple and efcient plan solution, where all functions are organized along a central atrium. Atrium itself relatively narrow, but achieves spaciousness through diﬀerent add-ons like amphitheatre, the main staircase, a small stage, waiting area at the entrance and the like. The gallery on the second ﬂoor is suspended from the roof with steel cables adding to the lightness and openness of the main atrium. 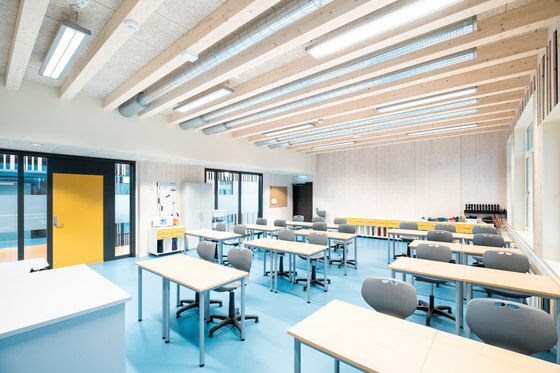 Daylight has been an important aspect for the design of classrooms. With the use of glass in the internal walls towards the atrium, most of the spaces can be daylit both from the external facade and through the clerestories and glazing at the ends of the internal atrium. 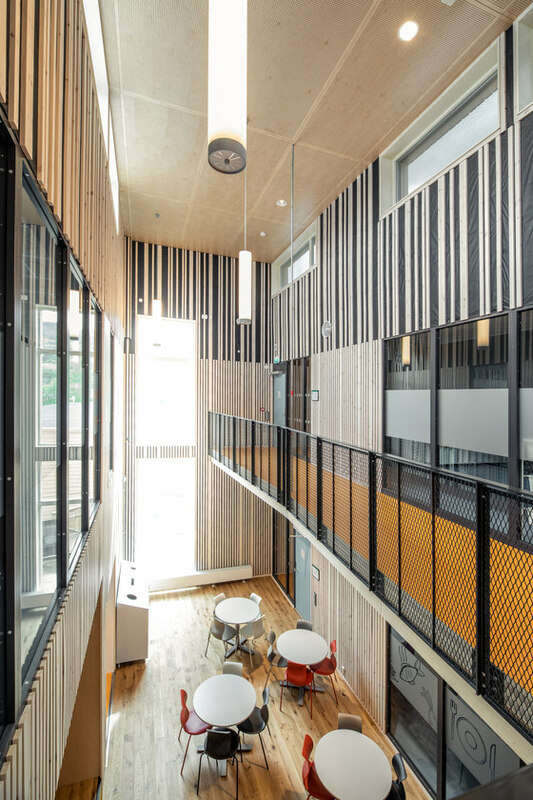 Use of wood and wood-based materials in both the load-bearing structure and external and internal cladding was another crucial aspect of the building. 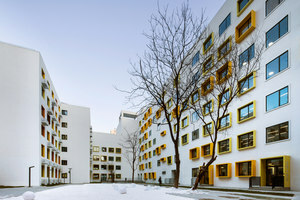 The building also complies with passive house standard, which means very low heating demand during the long heating season in Norway. 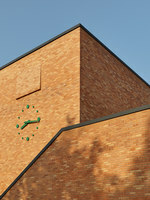 The good availability of daylight in the school building reduces the energy use for lighting. Together with efcient technical systems these strategies contribute to reducing the environmental footprint of the building. 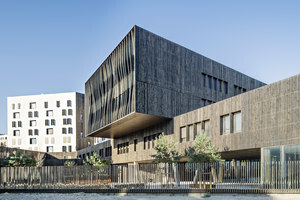 To avoid the signifcant environmental footprint linked to the use of concrete and steel, the load-bearing structure of the school is made entirely of timber. 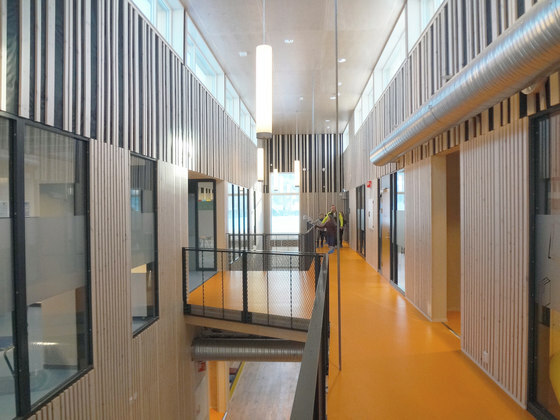 Columns and beams are made of glue laminated timber (glulam) and cross laminated timber (CLT) elements were used for bracing, elevator shaft walls, ﬂoor slabs for gallery in the second ﬂoor and internal stair elements. 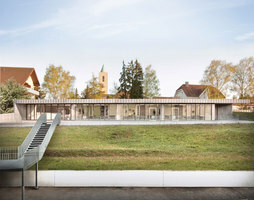 The gallery is suspended from the roof with steel cables. 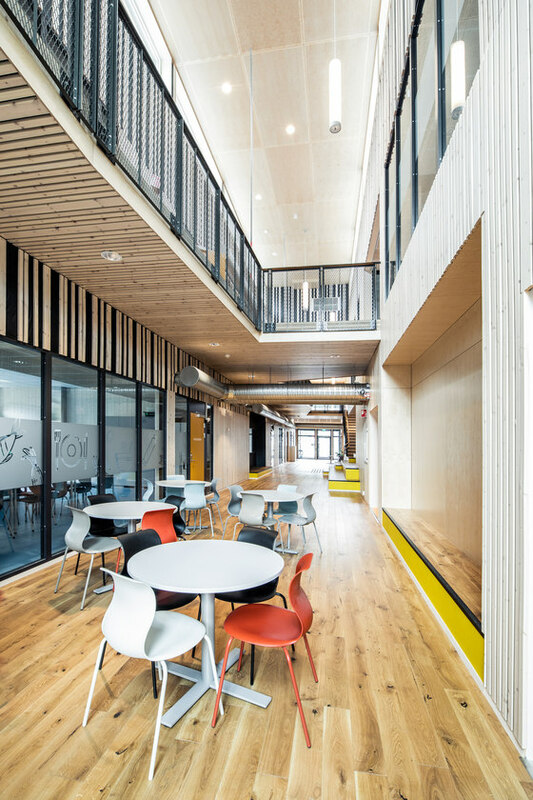 Due to the long spans of over 7.5 m used in the classrooms, CLT slabs with ribs are used. In the fnished building the ribs remain largely visible as practically no suspended ceilings are used. The local builder had little experience in building with such elements from before, but the construction workers were eventually very happy with the simplicity of working with a single material (wood), and not having to worry about several materials (concrete, steel, wood), each with its own connection details and tolerances. 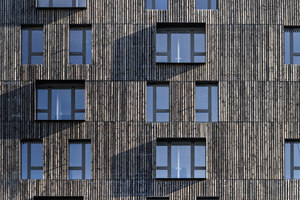 The use of timber in load-bearing structures as well as for external and internal cladding has been a prerequisite for the project from the competition phase. 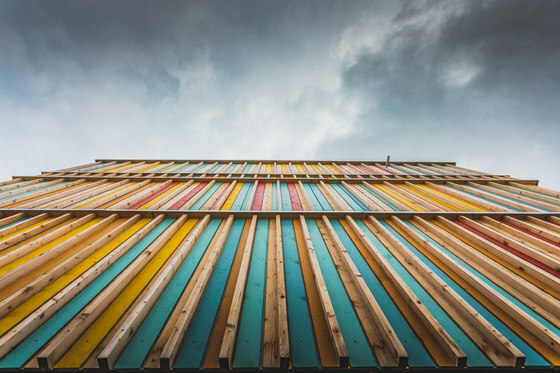 To reduce the need for maintenance untreated local dense spruce cladding and charred wood cladding is used for the exterior cladding of the building. The charred wood volume marks the part of the building dedicated to administration and teachers ofces. The lighter untreated wood volume marks classrooms and other pupil areas. 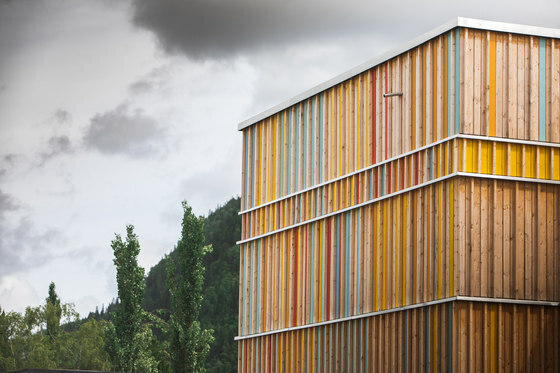 Colours have been used on some of the boards of the otherwise untreated spruce cladding. 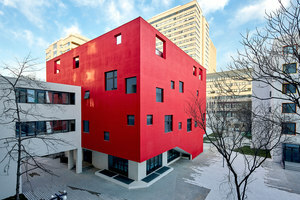 The expression of the building and colours changes as you go around the building. The overhanging volume next to the main entrance is marked with a larger number of painted boards. 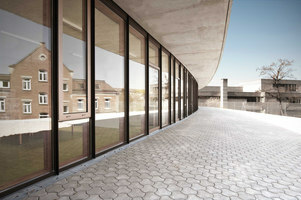 The same colour palette is used for the interior and furniture. 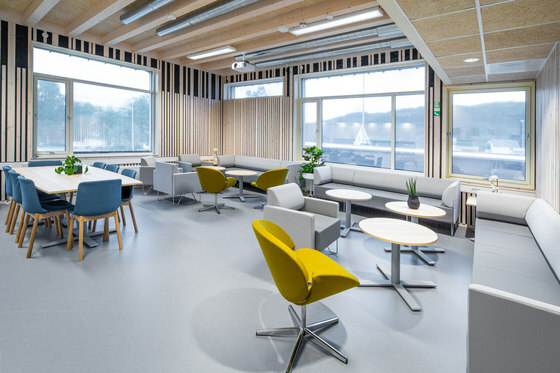 Wood and wood-based materials have been used for most of the internal surfaces. Where possible the CLT walls are left exposed. 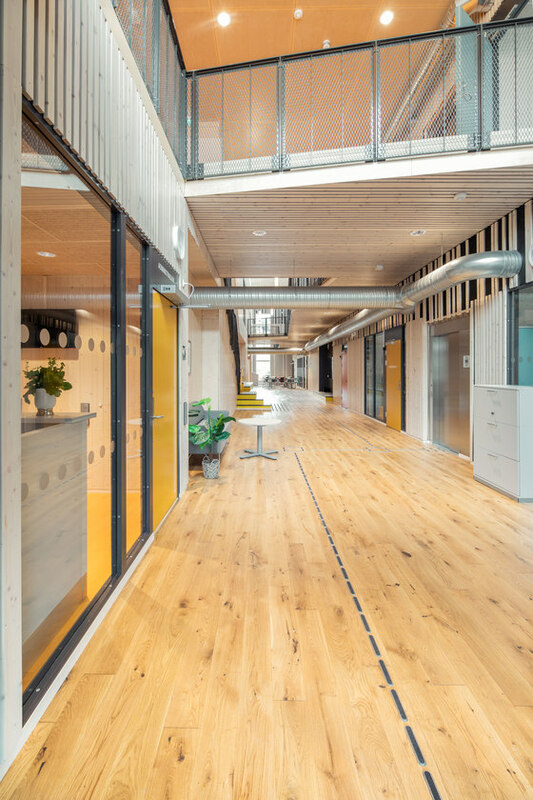 Wooden ﬂooring is used in the common spaces on the frst ﬂoor. Colourful linoleum (a material based on renewable resources) is used in classrooms and most of the other areas in the building. 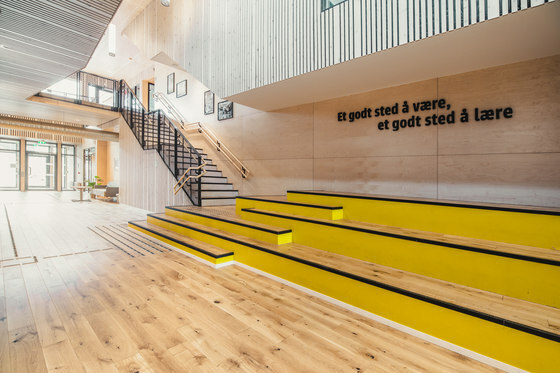 Acoustic requirements in Norway are relatively high for schools and aﬀect most of the surfaces in the school. 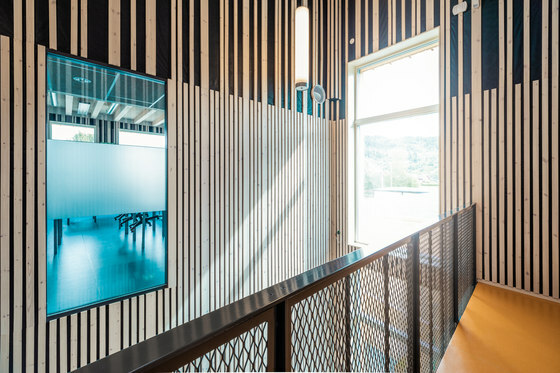 Walls with acoustic requirements are clad with wooden boards with gaps mounted in front of an absorbent (insulation covered with black acoustic membrane). To increase the absorption surface the upper part of walls has larger gaps between the wooden boards. 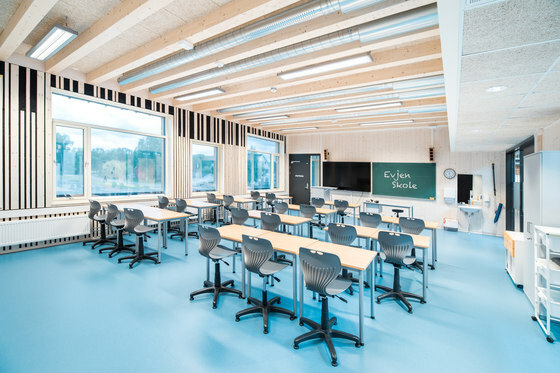 In classrooms the gaps between the ribs in the CLT slabs in the ceilings are flled in with cement-bonded wood wool panels. Railing for staircases and the suspended gallery are made of ﬂattened expanded material to reduce material use and also achieve a high degree of transparency.